PRODUCT DESCRIPTION: This is an ultra sound bird repeller that can run off electricity or batteries. It has several features which make it ideal for outdoor applications. This unit has a built in motion detector. This detector has a range of 35 ft x 70 feet and the coverage of sound is about 900 sq/ft. It comes with an AC power converter that can be used to power the unit via an electric outlet. The included cord is 30 feet long and when powered by the AC power brick (which is included), the unit will run continuously so it's always repelling birds. It can also be powered by 4 "C" cell batteries. Since the unit will only use power when batteries are the main power supply, the batteries should last several months. WHERE TO USE IT: Generally these units should be installed outside the home on deck railing, under soffits, on the roof, on a tree, around a car and basically anywhere birds are a problem. Here are some guidelines to consider regarding the installation. First, Ultra Sound is very much directional. This means you must be directly in it's line – much like a beam of light from a flashlight – to a specific target site. Secondly, Ultra Sound does not penetrate anything well at all. This means it cannot go through walls, plants, around buildings, etc. It is effective only in the area directly in front of where a unit is placed. EFFECTIVE AGAINST: Pigeons, Blackbirds, Crows, Ducks, Grackles, Gulls and Sparrows and Starlings. 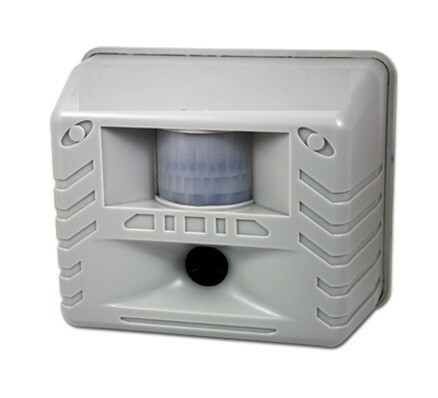 One unit can protect up to 1000 sq/ft; the motion detector can be activated by birds up to 70 feet away.